See therapists in Smyrna, GA.
A safe space for Black women ages 25-45 to discuss uncomfortable topics without judgment. Explore your truths without feelings of insecurity and shame. The Strong Black Woman is faced with both positive and negative stereotypes and half-truths. Consider those times you "put on your Sunday's best" just to appease the expectations of others. What about all the topics you dare not speak for fear of being seen as weak, ungrateful, or incompetent. "Don't let them see you sweat", they say. Well if we're all sweating, why don't we sweat together instead of hiding and hoping no one notices our anxiety. Click over�to apply for a seat at the discussion table. Simply complete the interest form and you will be contacted for a free initial consult. Rayvene focuses on empowering women to remove the mask of other people's expectations and have the AUDACITY to be themselves. Rayvene treats anxiety and depression by encouraging women to connect with their identities and ignore the noise of others' opinions and expectations. 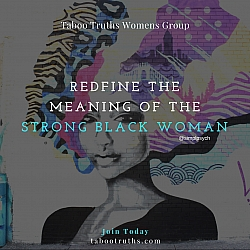 Rayvene's current research interests in the facade of the Strong Black Woman and Superwoman Syndrome have culminated in the founding of Taboo Truths Women's group. The group functions as a safe space to release undue pressures, debunk unrealistic expectations, and remind women that they are not alone. You do not have to suffer in silence.